Set a weekly repeating schedule for each of your services or make services available for offline booking only. 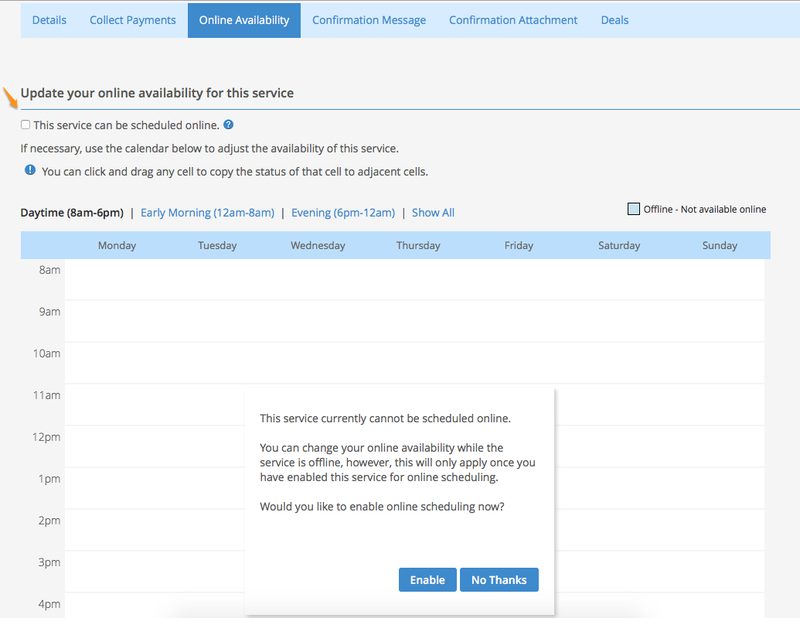 It's possible to set specific online scheduling availability for each service you offer, or to make a certain service only available offline (so only you can set appointments for them). To set a service's availability, click the Online Availability tab. 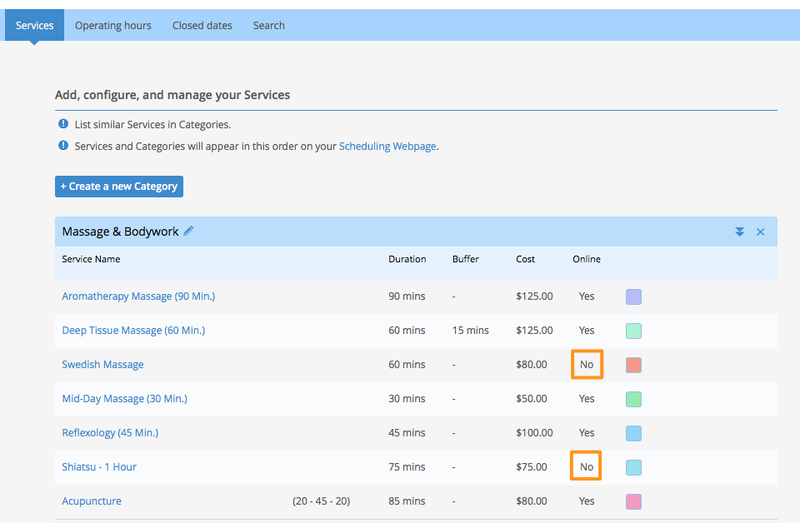 To keep a service completely offline — unavailable for booking by clients on your online scheduling page or the Genbook app — simply un-check the box next to "Online" at the top of the page. A dialog box will alert you that the service isn't available online. To undo the change, click "Enable". Otherwise, click "No Thanks" or leave it as is. There's no "Save" button on the Online Availability settings, so any changes you make go into effect automatically. TIP: Your service list (under Settings - Services) has a column titled "Online" where you'll be able to quickly see whether a service is available for online booking. You can also set schedules for your online services, as you would for your staff members. 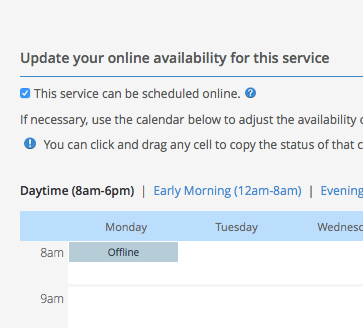 Click any open time at which you wish to make the service unavailable and the time slot will turn blue with the word "Offline" written in it. You can then click on an Offline slot and drag down or up, left or right, and diagonally, to make other time slots also Offline. 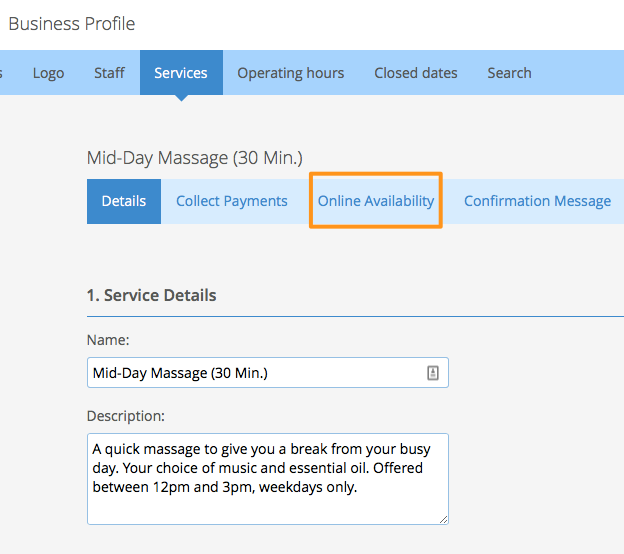 In the example below, the service Mid Day Massage is only available for client booking between 11am and 2pm, and therefore Offline the rest of the time. The Online Availability settings should reflect on your customer booking pages and in the Genbook app. A service's online availability will not affect when a service can be booked internally (offline) by your business. You have the freedom to book any service at any time when you're doing it directly in your Calendar. 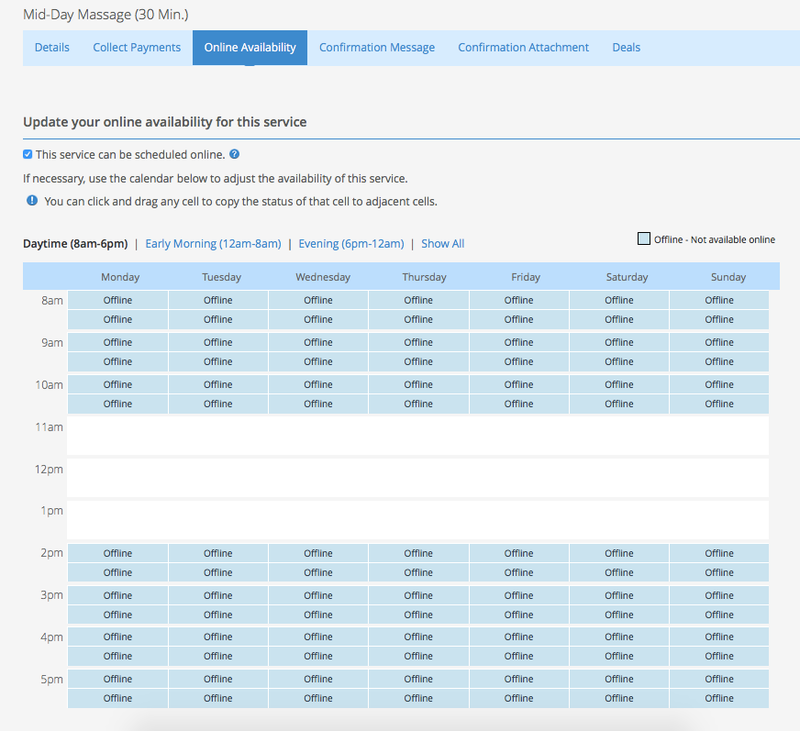 Service availability works with alongside staff members' availability, your business's Operating Hours, and your Online Appointment Start Times. That's to say, a client still can't book a service with a staff member who isn't available, or at a time when your business is closed, etc., even if the service is available at that time. Always allow enough time between Offline slots for at least one appointment containing the service to fit. 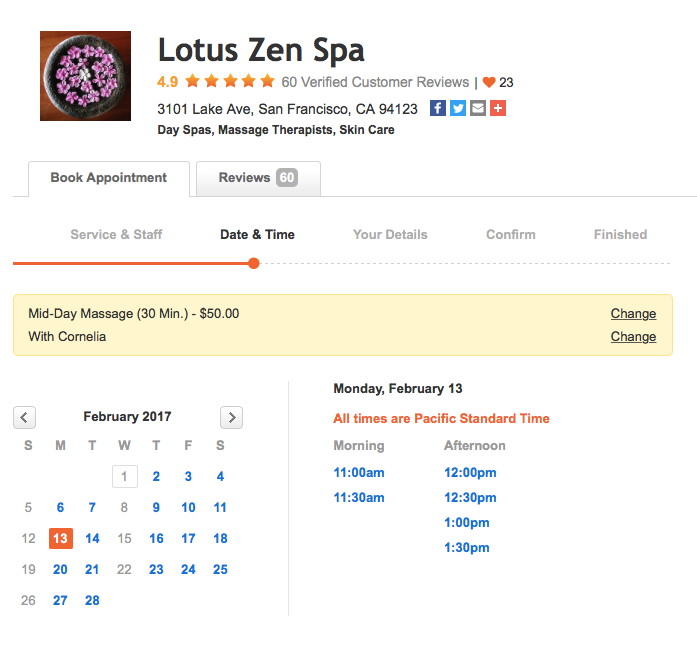 Appointment lengths are based on your service's Duration (set up on the Details page of the service). For example, you do NOT want to make a 90 minute service Offline all morning until Noon, then again for the rest of the day starting at 1:00pm.